You'II need to figure out what team you're on (because your role card might have been switched with another role card), and then figure out what teams the other players are on. At the end of each game you'll vote for a player who isn't on your team; the player that receives the most votes is "killed". If a Werewolf is killed, everyone on the village team wins. If no Werewolves are killed, the Werewolf team wins. The more you play One Night, the more you'll realize how important it is to wait until just the right time to reveal information, and how important it can be to lie, regardless of what team you started on. Because the game is so short, you'll probably end up playing multiple games. Because One Night is so different, it may take a few games until you get into the flow of figuring out what to say when, and soon you'll realize that events of previous games have an undeniable impact on the current game in terms of how players behave, who they believe, and what their real motivations are. Setup differs based on the number of players (3-10). For your first game, it's recommended that you play a 3-5 player game to get a quick sense of gameplay (If you have more, don't worry. The game is very quick and everyone else will enjoy watching). There should always be three more cards than the number of players. Shuffle the selected cards face down and deal one to each player. Put the remaining three cards and tokens that match all the cards being used in the middle of the table. There are several roles that are called on at night to do a night action. However, players with a Villager, Tanner, or Hunter card never wake up at night. Announcer: "everyone, Close Your Eyes". All players dose their eyes (including the Anoounour). "werewolves, Wake Up And Look For Other Werewolves". "werewolves, Close Your Eyes. Seer, Wake Up. You May Look At Another Player's Card Or Two Of The Center Cards". The player with the Seer card opens her eyes and may quietly look at one other player's card or any two of the cards in the center. "seer, Close Your Eyes. Robber, Wake Up. You may exchange your card with another player's card, and then view your new card". The player with the Robber card opens his eyes and may quietly exchange his card for another player's card, which he looks at. "robber, Close Your Eyes. Troublemaker, Wake Up. You May Exchange Cards Between Two Other Players". The Announcer, keeping his eyes closed, moves the cards around slightly (this ensures no one can claim a card was moved/inspected because it is no longer in its original position). All players open their eyes and look around suspicipusfy. At night, players who are not active (whose eyes are closed) may not move, point, or do anything to communicate with the active player(s). After the night phase, players discuss among themselves who they believe the Werewolves are. All players may say anything, but may never show their card to anyone. Werewolves might want to claim to be a different role so that they don't die. Because certain roles change other players' cards, some players will believe they are one role, when they are actually a different one. After the night phase, your role is the card that is currently in front of you, which may be different than your original role. No one may look at any cards after the night phase. After a few minutes of discussion, players vote. "everyone, Three, Two, One, Vote!" Each player points to another player. The player with the most votes dies and reveals his card. In case of a tie, all players tied with the most votes die and reveal their cards. If no player receives more than one vote, no one dies. One way the players might achieve this is if everyone votes in the same direction around the table, with each player receiving one vote (decide this as a group before you vote). If at least one Werewolf dies. Even if one or more players who are not Werewolves die in addition to a Werewolf dying, everyone on the village team wins. If no one is a Werewolf and no one dies. It is possible for no one to be a Werewolf if all Werewolf cards are in the center. 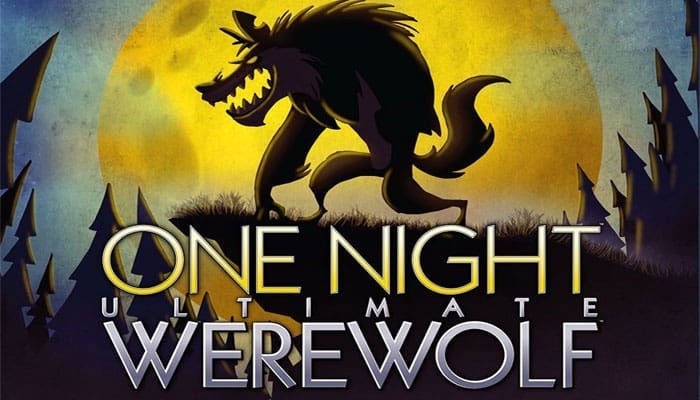 The werewolf team only wins if at least one play- er is a Werewolf and no Werewolves are killed. If you are playing with the Tanner, there are spe- cial rules regarding who wins; see the Tanner's role description for details. 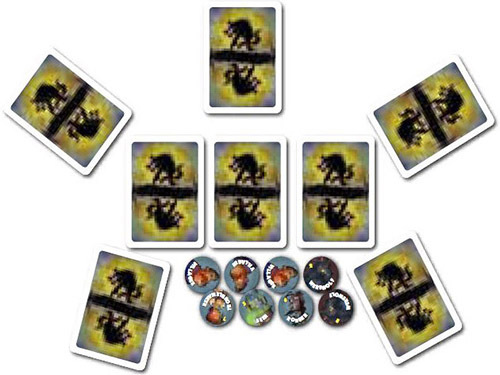 One Night Ultimate Werewolf includes role tokens that match each of the cards. 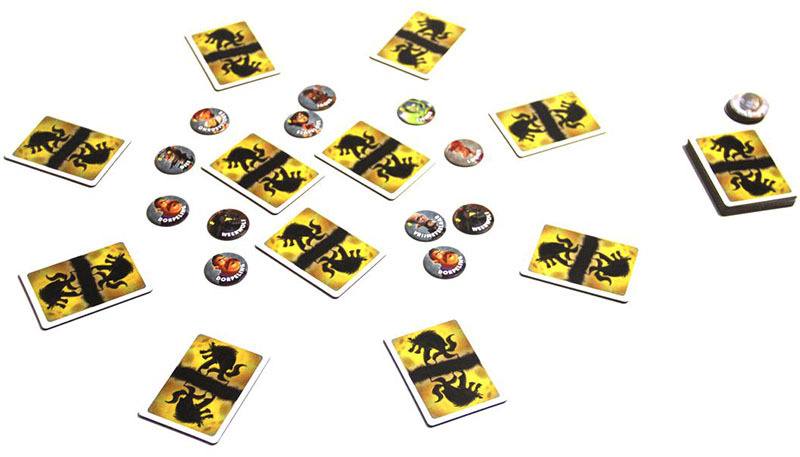 During the day phase of the game, players can use the tokens to help them deduce players' roles by placing appropriate tokens on top of cards that they've "verified". Having the role tokens that are in play during each game near the center of the table allows everyone to see which roles (and how many of each) are in the current game. The numbers on the tokens correspond to the night wake order. If you aren't using the App (though you really should), you can place the tokens being used in front of the player who is the Announcer, so that he can quickly determine the night order of the roles to call out.